Dinner: We felt like eating some delicious smoked brisket, so we headed over to Rudy's Country Store and Bar-B-Q (2451 South Capital of Texas Highway, Austin, TX‎ - (512) 329-5554‎) and ordered a pound of moist brisket, half a jalapeno sausage and a half rack of baby back ribs. 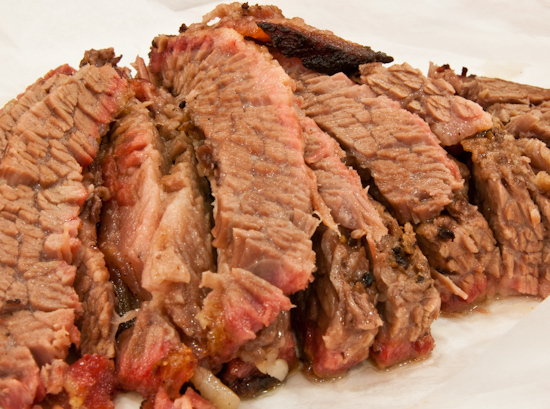 The brisket was juicy, fatty, tender, and extremely flavorful. 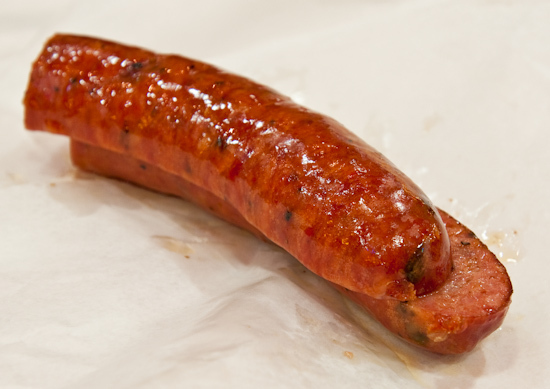 The jalapeno sausage had just a tad of spiciness. Just enough to give flavor without having it burn. Dinner: We had dinner at Gumbo's (710 Colorado Street, Austin, TX‎ - (512) 480-8053‎). We've eaten at gumbo's before (in 2008) and had a middling to poor experience there. The gumbo was not particularly tasty, the tilapia that Tina ordered was borderline inedible (they replaced it with blackened shrimp which was much better), and my steak was fine, but not inspiring. I had returned for a tasting in late 2009 and found the Redfish Francine to be particularly good. They didn't have redfish tonight, so we ordered flounder. 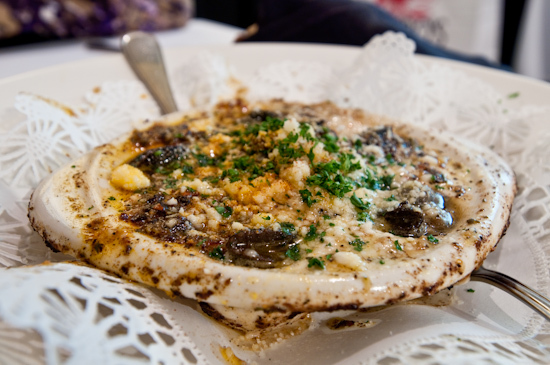 We started today's dinner with a serving of their Escargot (imported French snails, baked in beurre ál'ail and Cajun spices, $10). The escargot was very tender with no rubberiness or excess chewiness. 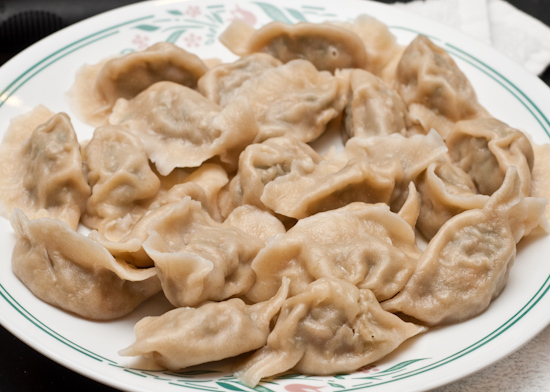 They were served hot (temperature) and slightly spicy with a pleasant acidity. Unfortunately, the sauce was a bit too salty. 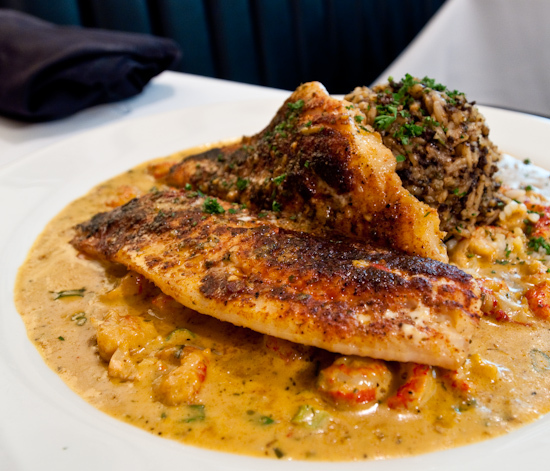 Flounder Francine (Blackened, served over crawfish tails sautéed in creamy tarragon sauce, $29). I loved this fish. It was excellently prepared - the fish was extremely tender and the delicate texture worked extremely well with the contrasting crawfish. The sauce was also well balanced for both the flounder and the crawfish. 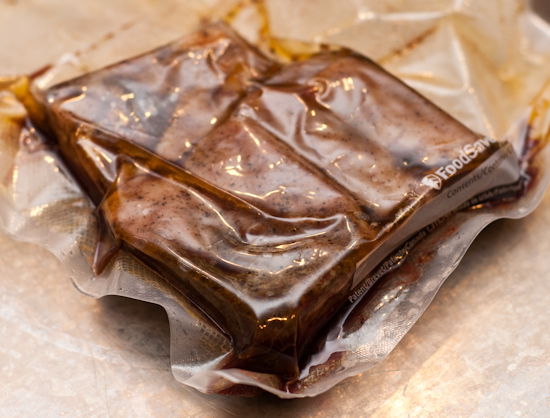 After I removed the short ribs from the water bath, I seared them on the grill while basting with the juices from the vacuum bag. 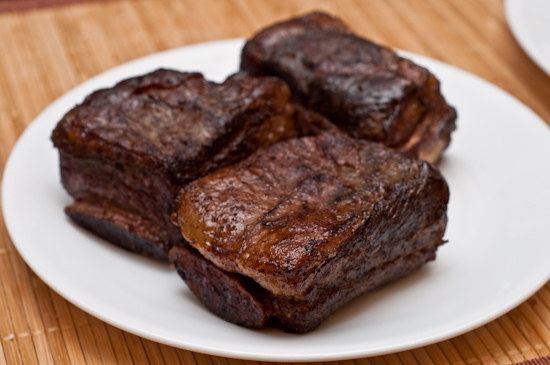 I've had a fair amount of food prepared sous vide at restaurants, but never short ribs. This was also the first time where we've had short ribs medium-rare (because when cooking short ribs it's best to use a cooking process that will convert collagen to gelatin which typically results in a fairly high internal temperature). (Of course, we've had thinly sliced short ribs cooked medium-rare in Korean BBQ, but nothing involving relatively large pieces of meat.) The result is some of the most flavorful and tender (falling apart in the mouth tenderness) beef we've ever had. I don't think I'm ever going to braise short ribs again when I can sous vide them. 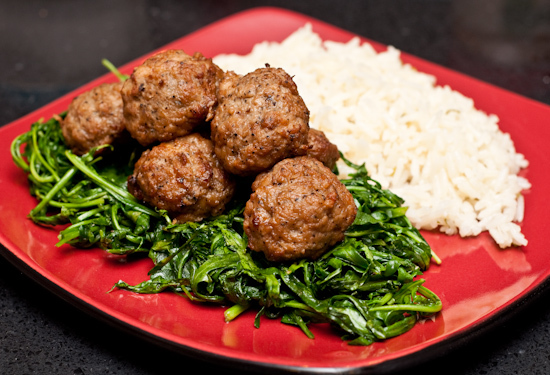 Dinner: I ate Aidells meatballs served on sauteed arugula and seasoned rice. 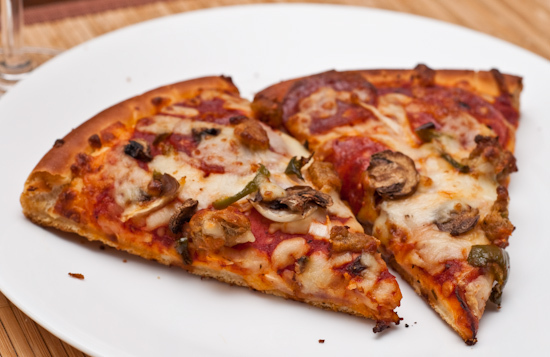 Lunch: I ate the remaining two slices of Domino's Deluxe Feast Deep Dish Pizza. 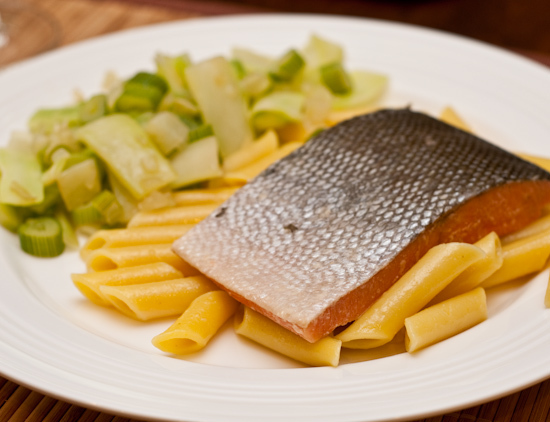 Lunch: I sous vide cooked two pieces of sockeye salmon to 49°C (120°F) as an experiment. I found it to be well textured, but a little overdone for our taste. Next time we'll try it at a slightly lower temperature. Tina prepared a lemon penne with olive oil and broccoli with fennel side. 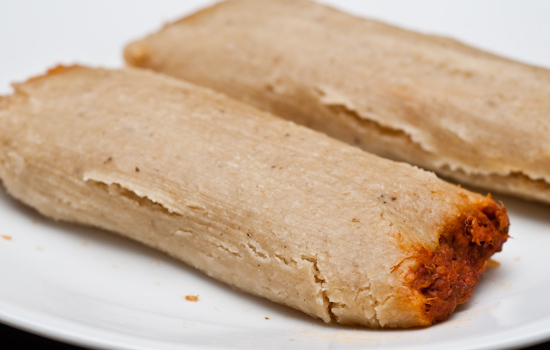 Lunch: I ate the last of the frozen tamales from Costco for lunch. 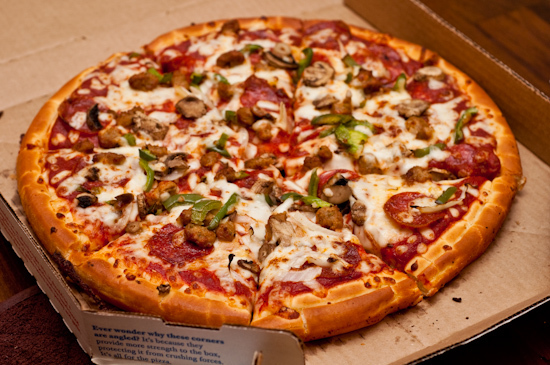 Dinner: I picked up a Domino's Pizza "Deep Dish" Deluxe Feast Pizza without the butter-garlic sauce brushed on the crust. This one was better than the last take-out pizza we had, but still just so-so. 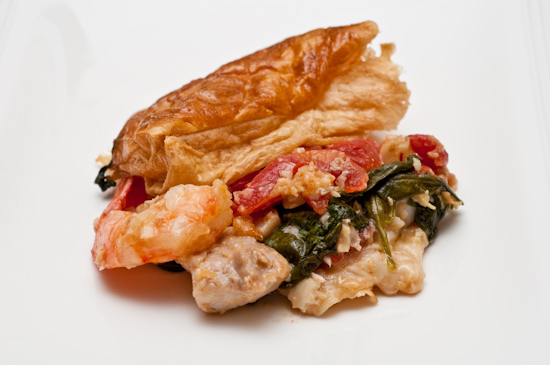 Lunch: We ate the leftover mushroom risotto and seafood with puff pastry from South Congress Cafe for lunch. 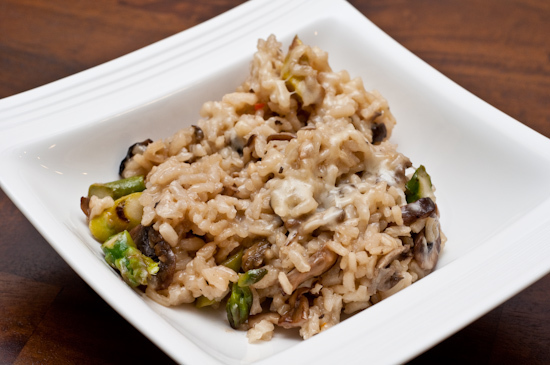 The risotto was a little bland until we added a pinch of salt which drastically increased its quality. Dinner: We ate dinner with Jeff Potter who is soon to come out with a book called Cooking For Geeks (which I think has a good chance to be on par with On Food and Cooking - keep an eye out for it when O'Reilly publishes it later this year). Originally, we were planning on going to The Odd Duck, but due to the rainy weather, we decided indoors would be better. We went to South Congress Cafe (1600 South Congress Avenue, Austin, TX‎ - (512) 447-3905‎). 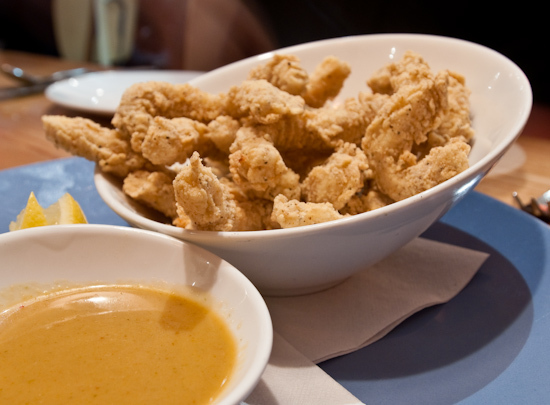 We split a calamari appetizer, which, as usual, are perfectly cooked (just long enough to be soft and tender without moving into the chewy stage). 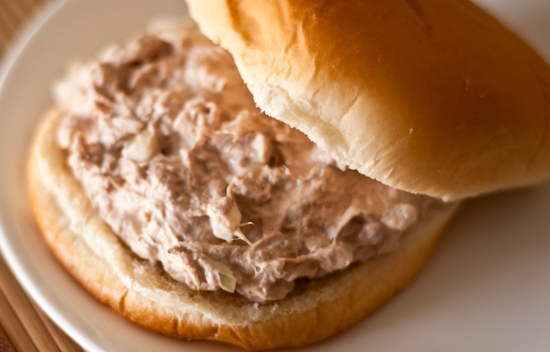 Lunch: Tuna fish salad sandwich. 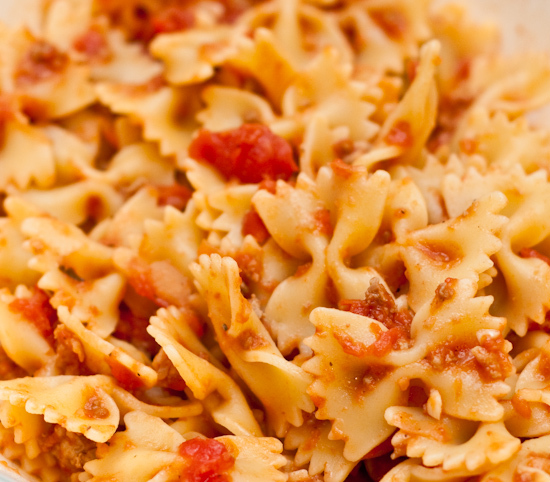 Dinner: Bowtie (farfalle) pasta with meat sauce. Lunch: Costco - again. 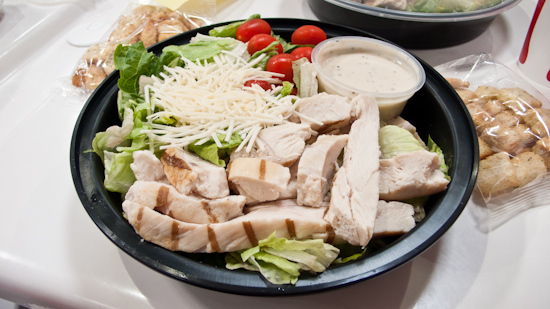 This time I got a Chicken Caesar Salad. 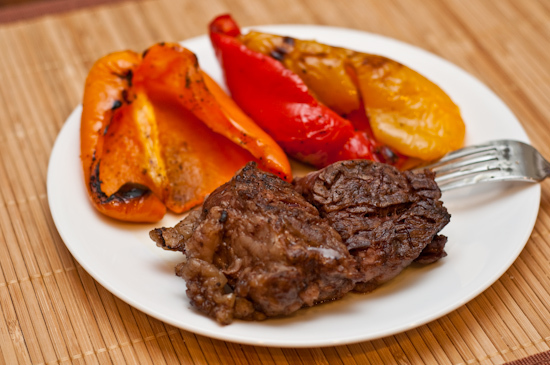 Dinner: After the premier of Elektra Luxx (where the digital projector failed before the last fifteen minutes, so no one got to see the end), I came home and ate the leftover steak and some grilled bell peppers. Today's SXSW celebrity shot is of Carla Gugino, Emmanuelle Chriqui, and Malin Ackerman during a Q&A period while we waited for the projector to be fixed (which never happened).